Visit the Monterey Bay Aquarium the weekend of September 12-13 to celebrate Otter Days. Otter Days includes special programs, crafts, face painting and otter-related prizes. There is also a chance to win behind-the-scenes tours of the sea otter exhibit. During Otter Days you will be able to learn more about efforts to save the endangered southern sea otter population from the Aquarium's Sea Otter Research and Conservation program and staff of Defenders of Wildlife. The Otter Days celebration will also be the last opportunity to see the African spotted-neck otters and the Asian small-clawed otters before the Wild About Otters special exhibit closes. The exhibit has been open for the last couple of years and is a fantastic exhibit. 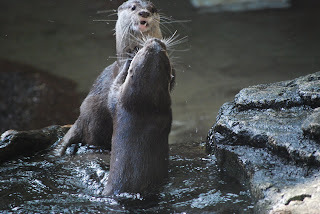 The otters on display are very playful, especially the Asian small-clawed otters and fascinating to watch. The exhibit contains several interactive exhibits and is especially geared towards children.